Step 1. Preheat oven to 180°C (160°C fan-forced). Fold two rows of foil to create grooves for the tacos and place in a rectangular baking dish. Set the taco shells into the foil racks. Step 2. Preheat a non-stick frying pan and cook the mince until browned. Add taco seasoning and water and cook for 2-3 minutes or until you have a thick spoon-able sauce. 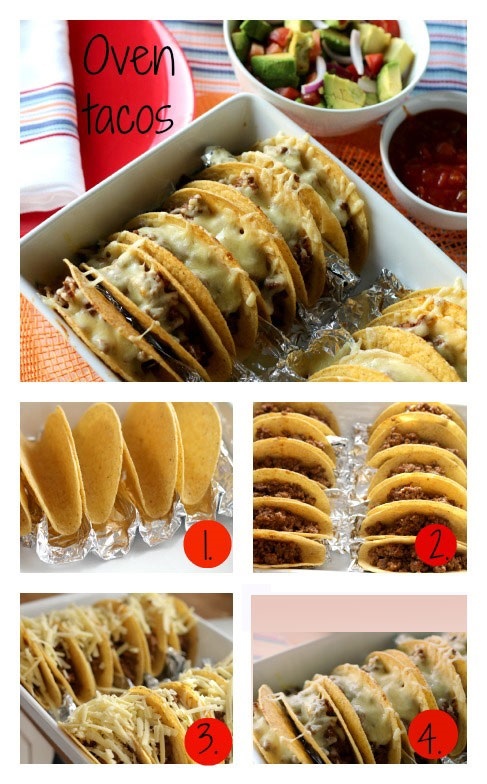 Spoon mince mixture into taco shells. Step 3. Top with grated cheese. Step 4. Bake for 15 minutes or until shells are crisp and the cheese has melted. Serve with iceberg lettuce, taco sauce and avocado salsa. If the mince mixture is too wet, it will give you soggy taco bottoms, which isn't ideal. You may need to drain the mixture to ensure you have extra crispy tacos. This is a great make-ahead meal. Just prep your salad ingredients and taco mixture ahead of time, then all you have to do is pop them in the oven and serve.